There’s nothing like gorging yourself at an upscale buffet, but some new research from the Cornell Food and Brand Lab has depressing news. It turns out your brain basically tricks you into thinking that the food at a buffet is better the more you pay for it. Thanks a lot, brain — you know I have student loans to pay, right? Researchers called it a self-fulfilling prophecy. When we pay more for food, we think it tastes better; when we go to a cheap buffet, we think the food is gross and get depressed that we ever went at all. I mean, that does seem to gel with my experience. But basically, even when the food quality is the same, we tend to enjoy the pricier stuff more. Not only that, but buffet owners are also constantly trying to manipulate you into eating less and getting full faster. Everything from the size of your plates, bowls and silverware to the number of cheap starches and vegetables available are chosen in a calculated way to make you eat less, saving the restaurant money. Now that we know about these tactics, it makes more sense than ever to try to make the most out of the buffet experience. 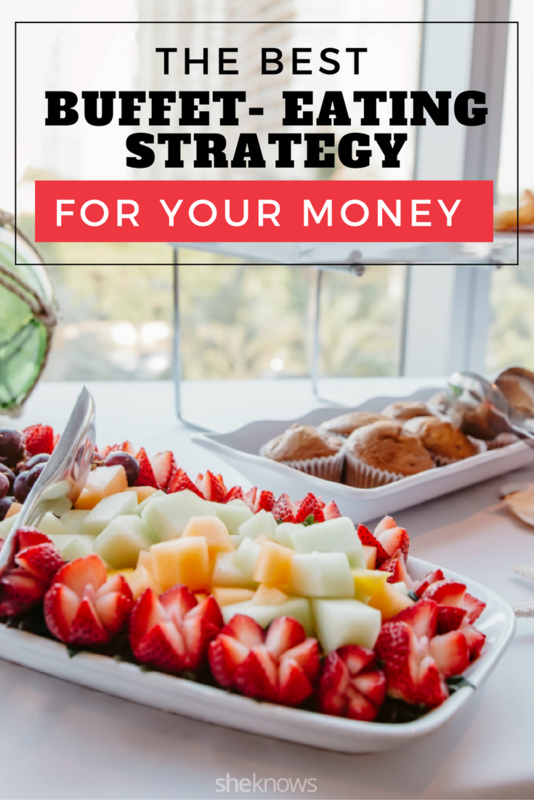 If I’m paying out the nose for OK buffet food I’m going to foolishly decide tastes gourmet based on price alone, you had better bet I’m also going to use the following strategies to stretch my dollar for all it’s worth. Skip the skinny jeans — the buffet is definitely time for stretchy pants. A loose-fitting dress and comfy leggings will do the trick too. Maximum comfort equals maximum quantity. To get your money’s worth, you should head straight to the pricey proteins. Salmon? Crab legs? Shrimp? Prime rib? All good choices. Skip the lame tilapia and overcooked chicken breast. If you’re looking to maximize the value of your trip, red meat and fancy fish are where it’s at. The salad bar is cheap to stock but will get you full. Skip it. You didn’t spend your hard-earned money to accidentally get full on underripe honeydew and wilted romaine lettuce, did you? Also skip those weird mayonnaise-based salads lurking in the buffet. They’re cheap as hell to make but are superheavy and will destroy your stomach before you get to the good stuff. Many buffets give you huge beverage cups. That’s because they want you to fill up on fountain soda, which costs basically a penny to make a million gallons. Not really, but it is supercheap to make and fills your stomach to the brim, meaning you basically spent $15-plus on a big cup of cola. 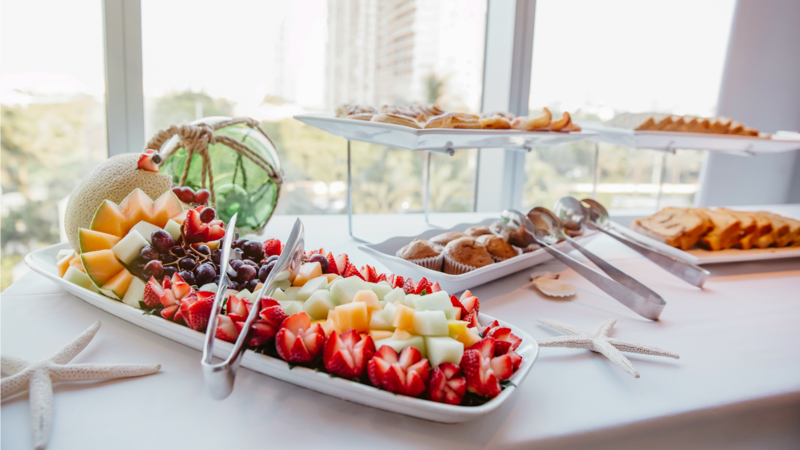 Instead, hydrate with plenty of water throughout the course of the day leading up to your trip instead of wasting valuable stomach space on beverages when you’re at the buffet. Lunchtime buffets are often vastly cheaper than their dinnertime counterparts. Most of the time they offer the same selection of food (though at cheaper buffets, they may leave out some of the pricier items, like the prime rib carving station). Plus, you’ll have more time to digest your food after your meal instead of packing it in at dinner and not being able to sleep later. Don’t wolf down a heaping plate of food within minutes of arriving at the buffet. Take a little bit of what looks good, and sample it at a normal pace, going back for another plate after you’ve decided what you want to try more of. The key is to eat at a steady rate. If you eat too fast, you’ll get way too full too fast. Think about it — you can get a pound of pasta at the grocery store for about a dollar, and when restaurants buy it wholesale, it’s even cheaper. The same goes for bread. Bread is basically just water, flour and yeast. If you want to maximize the value of your buffet trip, skip the pasta and bread. They’ll fill you up in a heartbeat and are too cheap to justify the stomach space. The morning of, don’t skip breakfast. It’ll help prepare your body for the onslaught later in the day. Drink lots of water before you head to the buffet, and consider going to the gym or for a brisk walk earlier in the day to help stimulate your appetite. Buffets usually set tiny bowls by the dessert section. They’re trying to encourage you to eat less, saving them money. Instead, go all in with a bowl from the salad bar or a plate from the entrée buffet line, and load up on the sweets. Post-buffet, take care of yourself. Going for a long, leisurely walk will help you digest better. Sip water to help rehydrate after eating all those salty foods, and consider enjoying a glass of mint or ginger tea to help quell any indigestion. Not that the buffet is all about overdoing it — it’s about indulging as a special treat.